Typically, there are at least two main categories of bootlegs out there – bootlegs that truly add to an artist’s mystique or reputation, and those that simply help fill in the last nooks & crannies of a handful of collectors’ & obsessives’ wet dreams. With regard to 1960s paisley artrock heroes LOVE, I’ve now heard bootlegs that cater to each crowd. The former is represented by “Black Beauty & Other Rarities”, which I wrote something up about a few months ago. 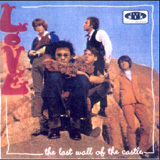 The latter, at least until the last 4-5 tracks, is represented by this one, “The Last Wall of the Castle” – a bootleg designed for those few for whom studio banter, multiple piss-takes & instrumental backing tracks are like manna from rock and roll heaven. I’m not knocking some folks’ desire to hear seven instrumental versions of the screaming surf/punker “7+7 Is”, all the way up to Take 88 (88 takes of this song!! I’m assuming the #89 is the one that made it to the album), but because they’re sequenced all in order here, it does get to be a bit much. Likewise for the four near-identical instrumental backing tracks for “Just For You”, aka “Your Mind And We Belong Together”. Face it, you’re just not gonna be interested in that if you enjoy other things in life, like sunlight and conversing with friends. What you might get excited about is the quieter alternate version of “A House is Not a Motel”, or the absolutely brilliant alternate take on “You Set The Scene”. What a great song. I realized sometime in the past 12 months that LOVE wrote the best wimpy psychedelic pop songs of their era, and that I am sorry I dismissed them early in life. One other couplet of songs to note: "My Little Red Book" and "A Message to Pretty" from their appearance on "American Bandstand", believe it or not -- but before you get too excited, I am 97.3% certain that these are NOT live tracks & were studio mixes that Arthur Lee & co. lipsynched to on the Bandstand. This might be worth borrowing from a LOVE aficionado for a little rip, mix & burn action, but paying $30 for it at a collector faire might also be considered a bit much.